Hi Friends and happy mid-summer! 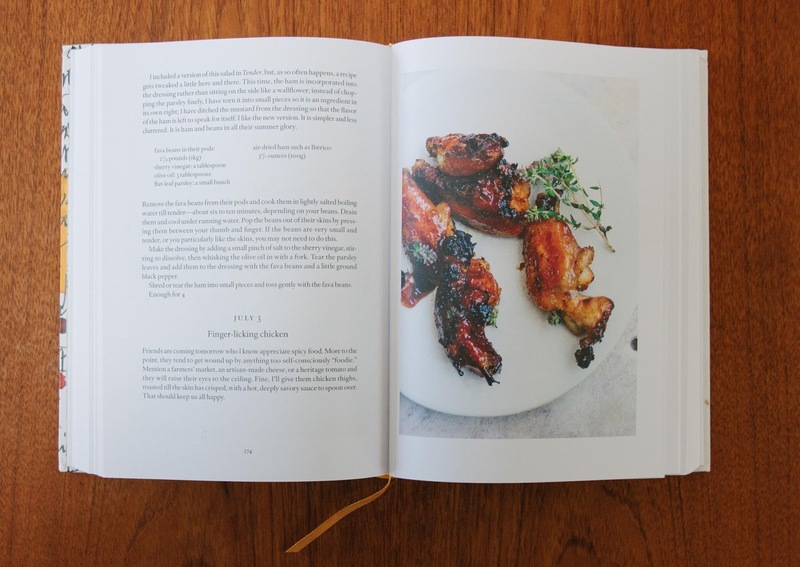 We actually made these chicken thighs, which Nigel Slater refers to as wings (seemingly for the fun of it?) over two weeks ago, but I haven’t had the chance to write about them until now. This isn’t the chicken’s fault. The chicken was delicious. It’s the fault of summer. Matt’s parents came to visit and we spent the Fourth of July weekend in Santa Ynez, which was really amazing. There was a pool and a giant front yard where Matt and his dad played soccer with such intensity that we’re pretty sure he went home to Pittsburgh with a broken toe. We picked raspberries in the hot sun and watched movies at night. But my favorite part by far was not being in charge of meals and cooking and/or cleaning up after them. They say that just like every baby is different, so is every pregnancy. And following this pattern: so is every pregnancy announcement on one’s blog. Specifically, I’m thinking about the big way we unveiled the news about Teddy and it’s making me laugh. We were so young and quick with the video camera back then! 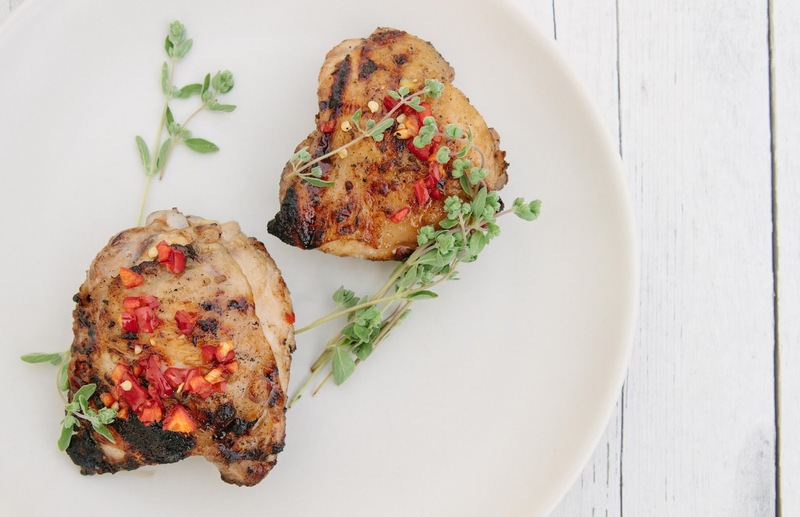 And now we’re announcing this major news with chicken thighs. Speaking of: Nigel Slater has you baking the thighs in the oven. However, he does mention that you could grill them. Since we wanted to get a really nice char on them, we went for the grilled option. And then we served them with some short-grain brown rice and a salad with a soy sauce/rice vinegar/grapeseed oil dressing. Like so many things, it was messy but well worth it. 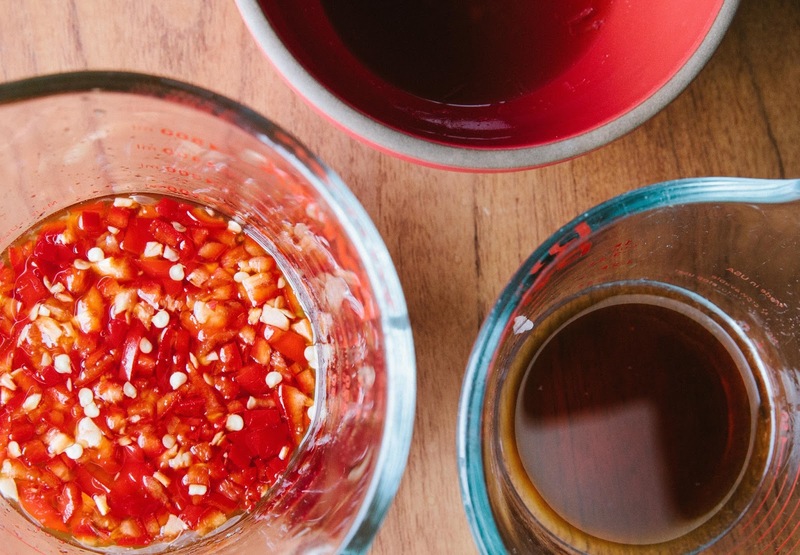 Make the marinade: put the oil, soy sauce, lime juice, and fish sauce in a small to medium-sized bowl. Peel and crush the garlic, thinly slice the lemongrass (removing any tough outer layers as you go), and add both to the bowl along with the sugar. Mix thoroughly. And then pour into a shallow bowl. Add the chicken pieces and set aside for at least an hour. Overnight is great. For the dipping sauce, put the fish sauce, water, rice vinegar, and sugar in a small saucepan and bring to a boil. Peel the ginger and chop it finely with a heavy knife, then crush it to a pulp with the flat of the blade. Add the ginger to the pan and let the mixture boil till it has started to thicken slightly. Leave to cool. Remove the stems from the chiles, halve the flesh, and chop it finely. Don't discard the seeds; you need their heat for this. Stir them into the sauce with the lime juice and soy sauce. 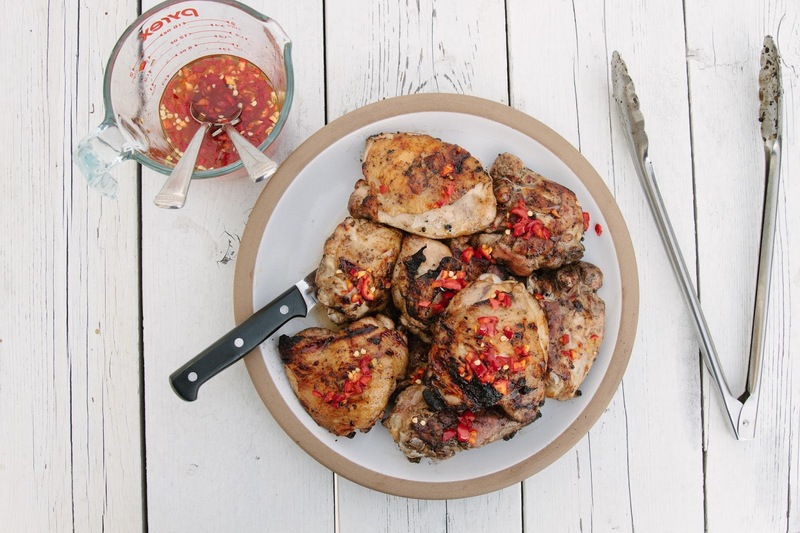 Serve with the chile dipping sauce, spooning it over the sizzling chicken. Yahoo! Baby number two! Congratulations and here's to hoping the new babe lets you catch some z's! Wow wow wow - congratulations to you both!!! love all these flavors (might be my childhood coming out, but i'm in love with fish sauce). congrats on the baby!! !!!!!!!! Such exciting news coupled with some delectable sounding thighs! What more could one wish for? Congrats! Congratulations Matt and Amelia and Teddy! Another cross stitched stocking, hurray! Wow! 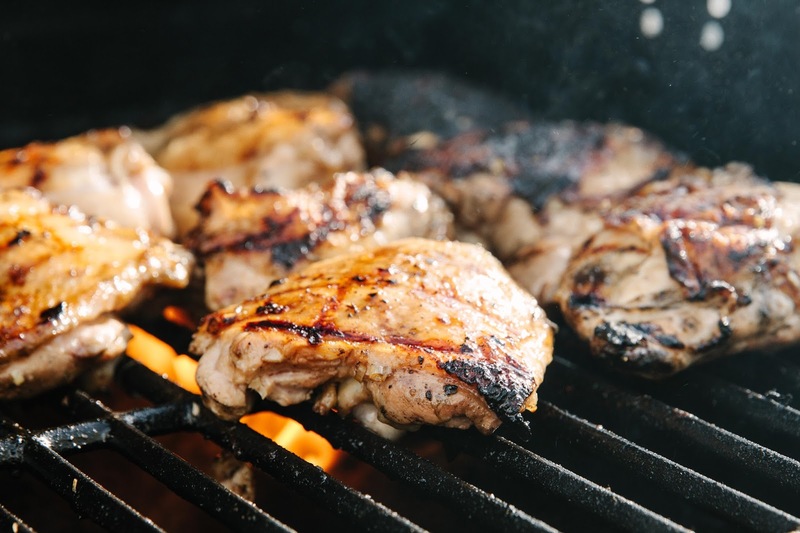 That was a surprising few words mixed into a paragraph about chicken thighs! Congratulations ! Also, these look delicious! I've been missing the blog posts, but it sounds like you've been busy making babies and enjoying summer - a beautiful thing indeed! And--I am beoming a first time grandma in November! Congratulations, Amelia! We're due around the same time (baby #1 for me). Now that I can stomach chicken again, I'm going to make this recipe. YAAAAAAAY AMELIA AND MATT!!!!!! I AM SO HAPPY FOR YOU GUYS!!!! 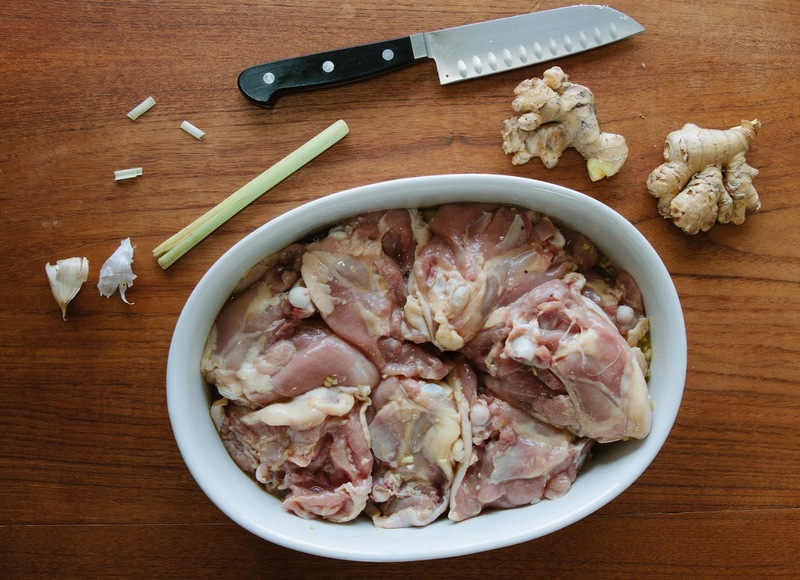 I think chicken thighs are the perfect way to celebrate a baby given that babies are basically all thighs from 3 -12 (?) months!! How exciting! The thighs & baby! Mega exciting news! I keep thinking about how fast the next round comes (assuming two-ish years apart). My 15 month old doesn't even sleep through the night yet. Gah! @Hailey thank you! And sorry for the lack of posts. The good news is I've been getting *some* (fiction) writing done during the day so maybe one day there will be a second book too? Babies are so great! Congratulations!! Congratulations to Matt on the awesome soccer workout! Also good job on the chicken. (and the new baby, that's cool).